Disney Vacation Club Disney Riviera Resort Sweepstakes: Enter at rivieraresortsweeps.com for your chance to win a 5-day, 4-night Disney Vacation Club getaway to Disney’s Riviera Resort. 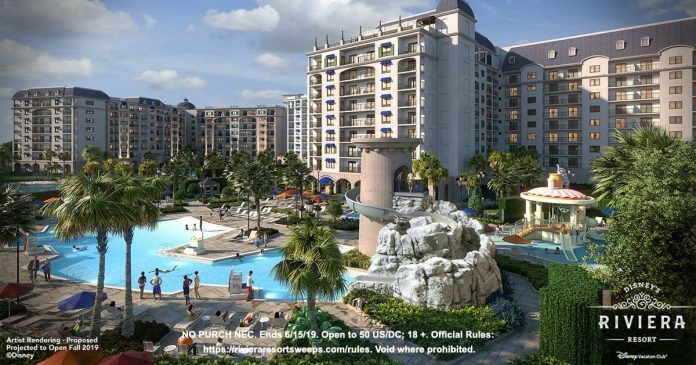 The grand prize is valued at over $20,000 and includes accommodations in a Two-Bedroom Villa at Disney’s Riviera Resort, 3-Day Walt Disney World Theme Park Tickets with Park Hopper Option, airfare, and more. The Disney Vacation Club Disney’s Riviera Resort Sweepstakes is open only to individuals who are legal residents of, and physically located within the 50 United States and the District of Columbia, who are at least 18 years of age, or the age of majority in his/her jurisdiction of residence, whichever is older, as of date of entry. The Sweepstakes period begins on 12:00:00 PM (noon) ET on April 9, 2019 and ends at 11:59:59 PM ET on June 15, 2019. The Winner will receive a five (5) day/four (4) night Walt Disney World Resort vacation package for Winner and up to seven (7) guests. Riviera Resort Sweepstakes Winner List, P.O. Box 251328, West Bloomfield, MI 48325.